Tinea Pedis. Do You Have It? Book In At Podiatry HQ Today! — Tinea Pedis, Do You Have It? Have you been noticing that your feet are itchy and becoming red and flaky? Are you suffering from Tinea Pedis? Read on to find out if you are! 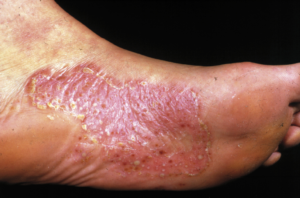 Tinea Pedis, often known as Athlete’s Foot is a common foot condition often experienced by young adults. Tinea Pedis is a fungal infection of the skin. People often contract this condition in swimming pools, gyms, communal bathrooms as fungi thrive in warm, humid and moist environments. If none of the signs and symptoms apply to you and you think it might be something else, come and visit one of your friendly podiatrists from Podiatry HQ and we can assess for you. You could have either psoriasis or dermatitis. There are various treatment options readily available for purchase. Majority of people respond very well to topical antifungal creams however if unresponsive, there are options for oral medication if skin scrapings come back positive for fungus. Addressing environmental factors is crucial in keeping those nasties at bay.